I’m often surprised at the obscure ways that people find my site through Google searches. Looking through my traffic statistics I find that one of the most popular methods used to find my blog is by searching for the term “ubuntu kernel version”. I would not have expected that to be a popular search term, but years after writing a post outlining methods to find your kernel version it still brings high traffic. This post is written as an update to the original post I wrote in way back in 2007. The Linux kernel is a core component of every Ubuntu system. It is primarily responsible for managing the system hardware. Having the ability to check what version you are running can be beneficial. From time to time there are vulnerabilities that affect specific kernel versions, and being able to verify whether or not you are affected can be helpful. Certain features and hardware support are tied to certain kernel versions as well. This post will outline how to discover your Ubuntu kernel version in two easy steps. 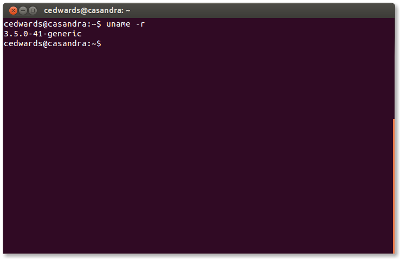 Discovering your Ubuntu kernel version can be done in just a few quick steps. I’ll outline these steps below. That’s it! The uname command can report information about the currently running kernel, including version, system hostname, system architecture and more. For more information see man uname. use gnome-system-monitor in gui, look for the system monitor in the menu and look in the first tab System.